Monochrome homewares and home decor makes a common appearance in Scandinavian interiors, and has a timeless appeal. Browse Chalk & Moss for monochrome designs including vases, tableware and more. Gardeners diary (A6 size) for planting dates, reminders, notes and shopping lists. Pages last a full year, but start the diary any time. Includes extra pages. Inspiring botanical design to get you in the spirit! 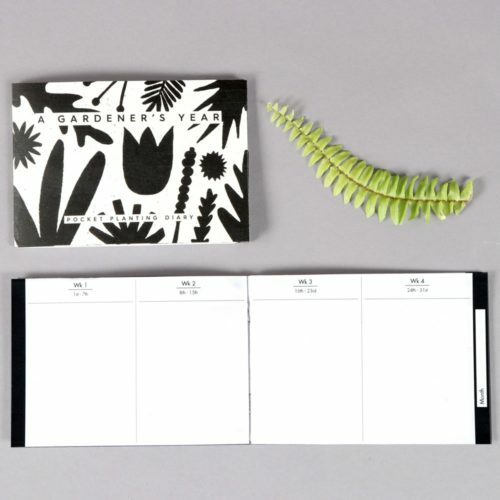 Beautiful A5 meal planner in a monochrome botanical print. Take the handy tear off shopping list along to the shops. 52 weeks to last a year.